Victor Emanuel Martin was born in London and spent his early years there. After his father’s premature death in 1898 he moved to Ilford before arriving in Chelmsford around 1912 where he worked as an engineer. Marriage soon followed as did two children. He landed in France within two weeks of the outbreak of war and was killed in action in November 1914. His mother lived in Mll Road. Victor and Emily had two sons: Victor Emanuel Martin (born on 8th April 1913 at 1 Mill Road; died in 1998), and Walter William Martin (born on 30th June 1914). Victor’s brother Leopold had married Emily Mary Brooks’ elder sister Gertrude the previous year in Ilford. In September 1913 Victor’s mother married Alfred Charles Howard, at the time giving her address as 1 Mill Road. 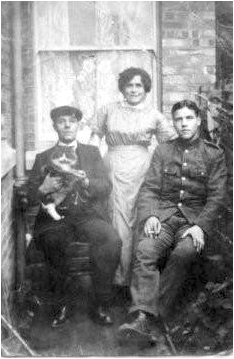 The photograph shows Victor, on the right and in uniform, his mother and step-father. It is thought to have been taken around the time of the start of the war. By the end of June 1914 Victor and his wife were living in Ilford near his mother’s relatives. When Victor enlisted at New Cross, Surrey he lived in Ilford. He served with the 1st Battalion of Princess Charlotte of Wales’s (Royal Berkshire Regiment), which was at Aldershot at the outbreak of the war, but soon moved to France. Victor entered France on 13th August 1914. He went missing in action and was later presumed to have been killed in action on 1st November 1914 while serving as Lance Corporal 6587. Victor has no known grave and is commemorated on the Ypres (Menin Gate) Memorial and on the Civic Centre Memorial, Chelmsford (which records his rank as ‘Corporal’). He was entitled to the 1914-15 Star, British War Medal, and Victory Medal. Victor’s widow remarried, in Folkestone, Kent in 1917, to William Norris. She lived at 11 Fernbank Crescent, in Folkestone. Victor’s brother Leopold, a father of three and Marconi worker, died from Tubercular Meningitis at Ellenor Cottage, Marconi Road, in Chelmsford in 1920 aged 31. Victor was born at 6 Ponsonby Place in Westminster, London, on 6th June 1884, the son of Edward Barrow Martin and Eliza Annie Spriggs. His father had been born in 1861 in Westminster. The couple had married in London in 1882. Victor’s five siblings were Edith Emma Martin (born in 1882), Edward G. Martin (born c1887), Leopold William L. Martin (born in 1889), George Charles Martin (born in 1893) and Ernest Martin. All the children were born in Westminster. The 1891 census found six year-old Victor living with his parents and three siblings at 20 Itchen Road, Mortlake in Surrey. His father was employed as a lighterman, on the River Thames, while the census recorded his mother as ‘Antionette’ Martin. Victor’s father died in May 1898 from Phthisis (Tuberculosis) and physical exhaustion. death of Victor’s father as that was where Victor’s mother’s sister lived. By 1912 the family had moved to Chelmsford. Recorded as then being aged 26, Victor married Emily Mary Brooks on 15th July 1912 at St. Mary’s Church, Chelmsford (the modern-day Cathedral). At the time he was an engineer living at 1 Mill Road, Chelmsford (now demolished), and probably working for Marconi’s. His bride, who also lived at the same address, was the daughter of James Brooks, a carpenter and had been born in Shepherd’s Bush, Middlesex c1894 and in 1911 had been living with her family at 29 Pelham Road in Ilford.